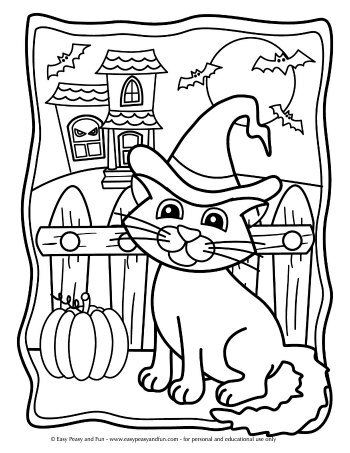 Sharpen your crayons or coloring pens as we have a bunch of unique Halloween coloring pages for kids – from the super simple ones with big areas to color and thick lines perfect for toddlers and preschoolers to more detailed ones kindergarteners and older kids will enjoy. 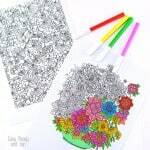 Want more coloring fun? 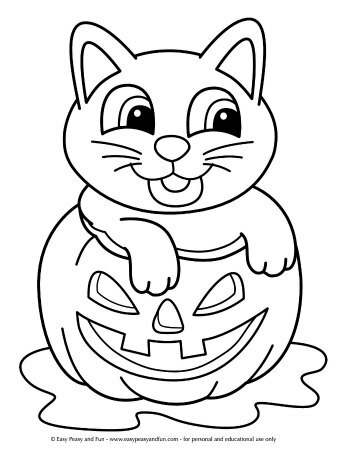 Browse all of our printable coloring pages for kids. 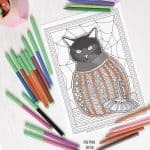 I loved designing each and every of these 20 Halloween coloring pages for kids, from the incy wincy cute spider to the cat on a broom. There is a whole variety of them too, so I am sure you will find just the one (or a dozen) for your needs and ages of kids. 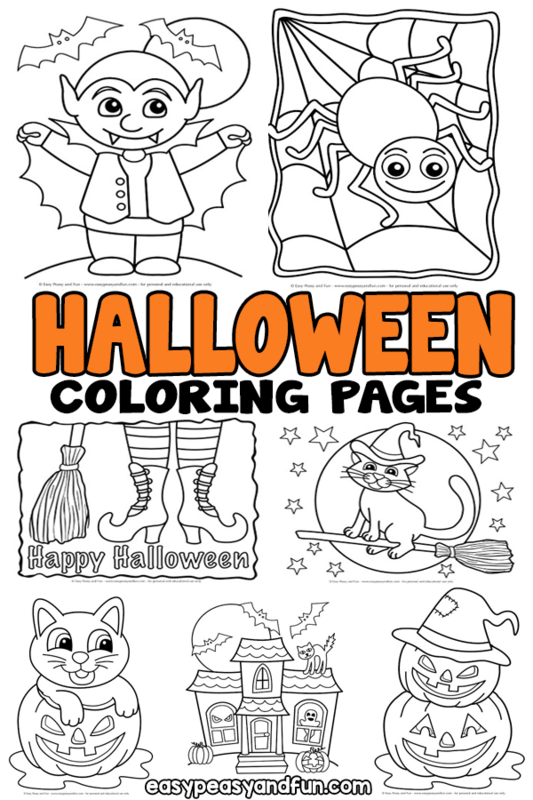 Most of these Halloween coloring pages aren’t scary at all – we do aim for a stress free experience rather than images from nightmares 🙂 – so these are great as handouts at a party made for kids or to use and color in the classroom. 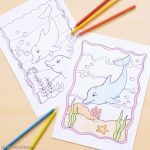 While some of the coloring pages in this set are available exlusively to our members, some of them are absolutely free for your personal use. We hope you will enjoy them. Halloween is that one day of the year where monsters and ghouls are free to roam the earth… Well kids in monster and ghoul costumes are. 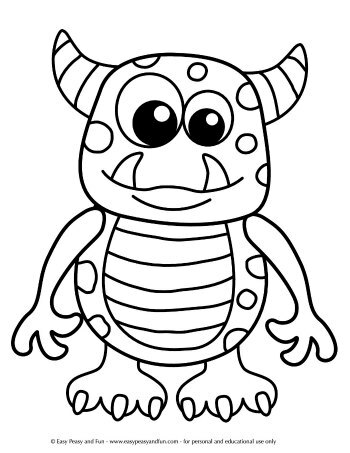 This little happy monster is aching to be colored. 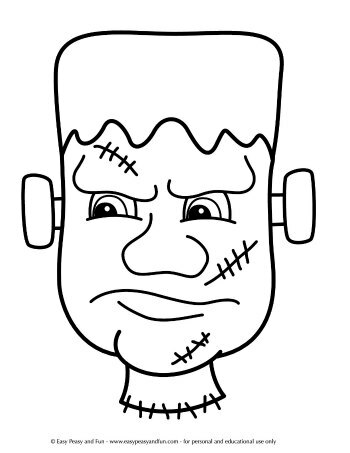 Print this Halloween monster coloring page freebie here. Are these bats or vampires transformed in bats? Who knows, but one thing is for sure, they are great to color in. Make them black, gray, purple, brown or any other color really – bats can wear costumes too. Feeling creative? 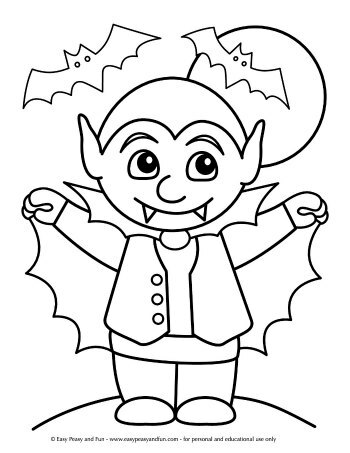 You can make your own coloring page like this too, with the help of our how to draw a bat tutorial. 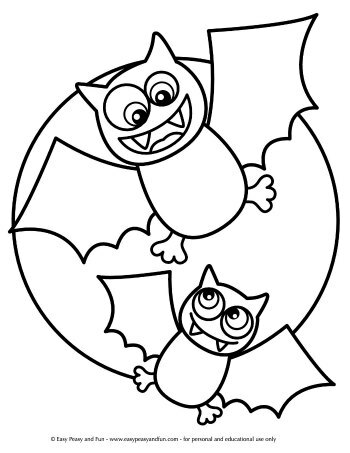 Grab this bat coloring page freebie here. 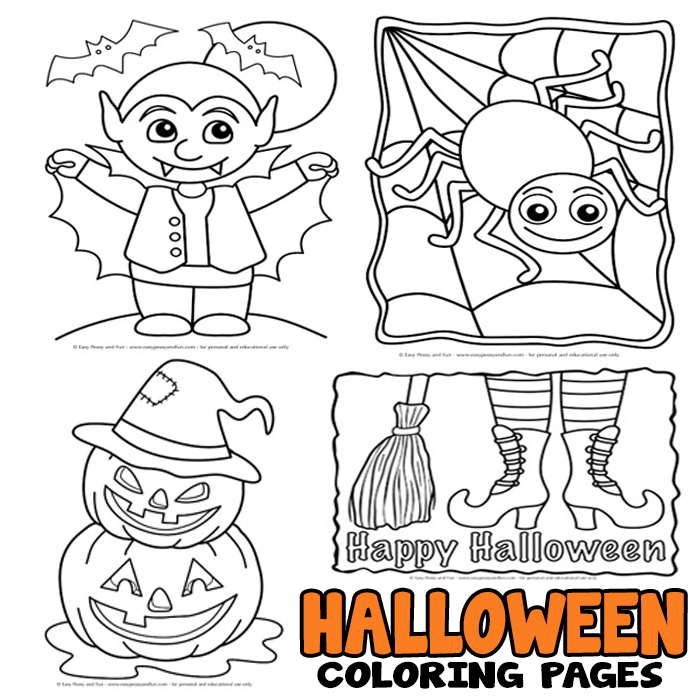 Wish someone a Happy Halloween with this colored coloring page. 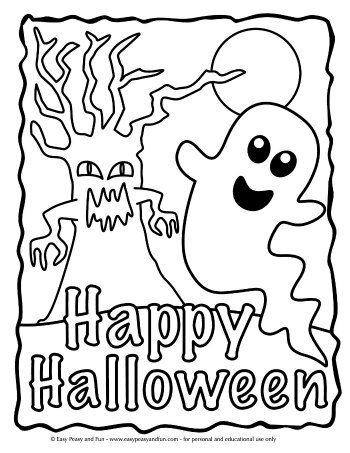 A happy looking ghost along with a scary looking haunted tree make a great pair. 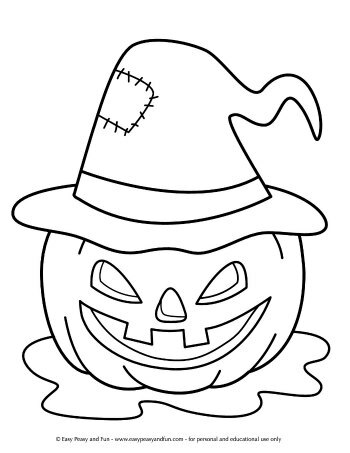 Grab this Happy Halloween coloring page freebie here. 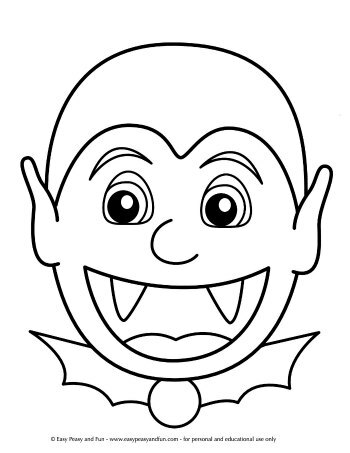 This vampire face is great for toddlers and preschoolers as it not only big chunky lines and large areas to color, it’s also a very nice, non scary vampire. Kids will love this one. 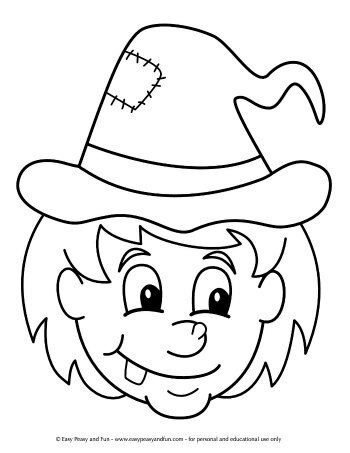 Print this vampire head coloring page freebie here. This one was my favorite to draw, I don’t know why, but I loved it from start to finish. I think the boots are awesome, but I might be a little bit subjective on the matter. This one is great to use as a gift to friends and family members to wish them a happy Halloween. 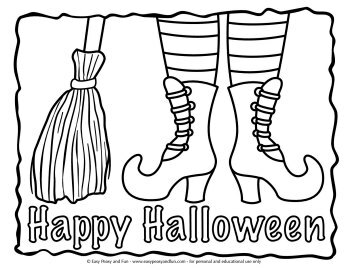 Grab this witch legs coloring page freebie here. Oh and there’s more. 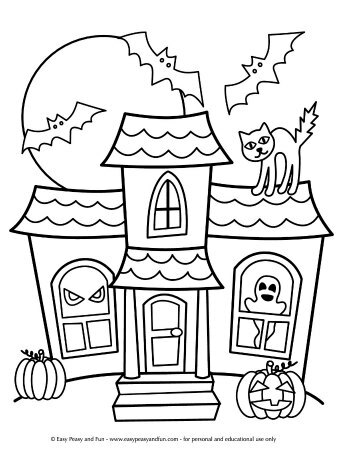 I’ve designed 20 fun Halloween coloring pages, from super easy ones for toddlers, preschoolers and a bit more detailed ones for older kids. 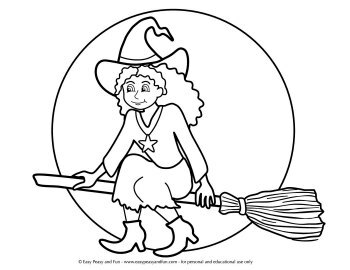 A classical Halloween scene, a friendly witch flying on her broom over the moon. This cat sure is a mischievous one. This one is ready to cast a magical spell. 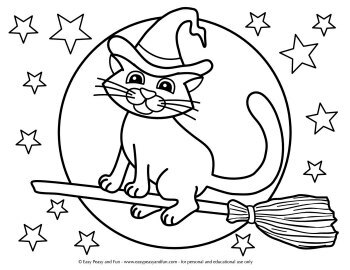 If you love cats and witches, you are going to love this Cat Witch coloring page. A wonderful Halloween themed scene. 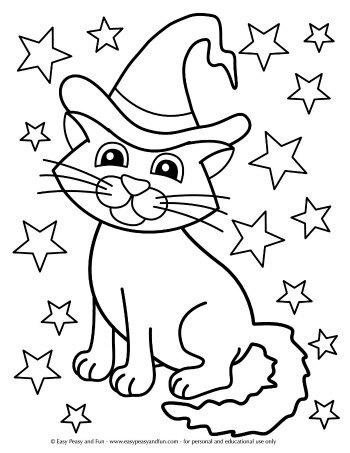 Another great coloring page for younger kids as it has thick lines and little detail. This one is a bit more detailed so older kids will enjoy it. 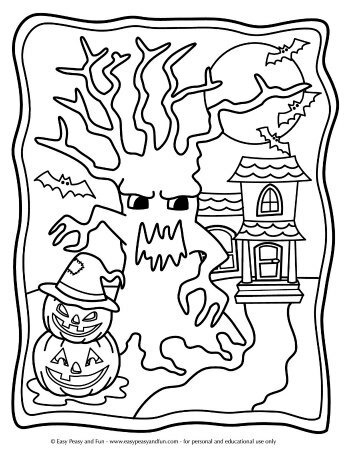 Can’t have a collection of Halloween coloring pages without at least one haunted mansion. 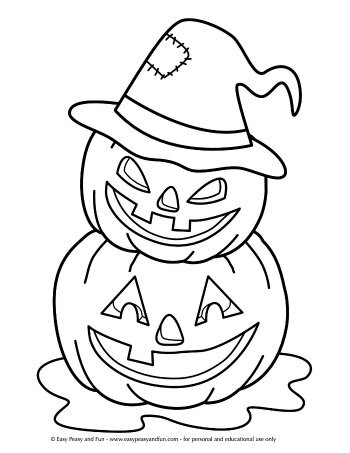 Two jack o lanterns stacked one on top of the other just waiting to be colored. And a single one with less detail. 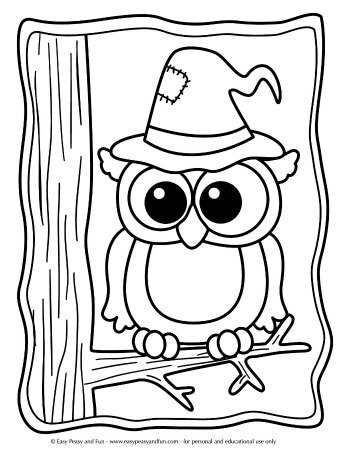 Owls are a huge part of Halloween too, this coloring page features an owl sitting on a tree wearing a witches’ hat. Don’t like this one? Make your own owl with our how to draw an owl instructions. 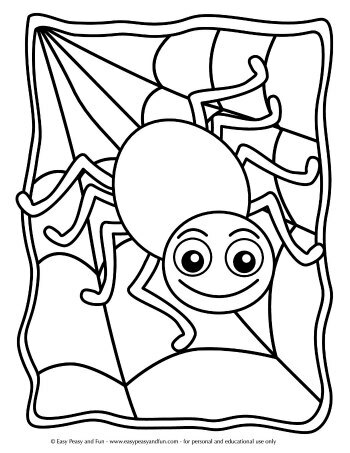 I am too afraid of spiders to design a scary one (although I will, when I’ll be drawing a set of spider coloring pages), so here’s a cute one for you. A cute little vampire ready to turn into a bat. 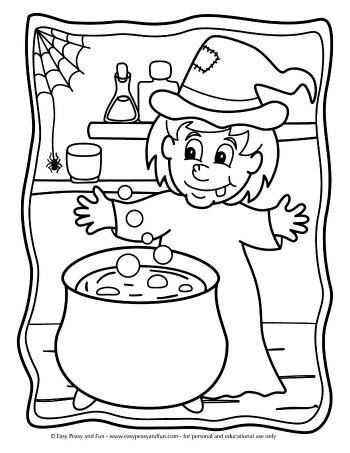 A witch making her magic potion. 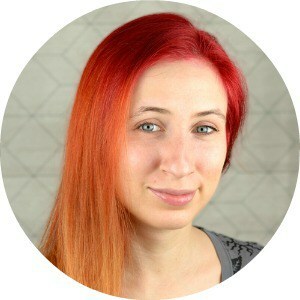 The whole printable is available in our members area. Become a member and gain aces to our growing collection of educational and crafty printables.